The 18th commemoration of the International Day of the World’s Indigenous Peoples was held on Thursday, 9 August 2012 at the UN Headquarters in New York, organized by the Secretariat of the Permanent Forum on Indigenous Issues DSPD/DESA, the United Nations Department of Public Information, and the NGO Committee on the Decade of the World’s Indigenous Peoples. There were statements delivered by the Secretary-General, the Under-Secretary-General for Economic and Social Affairs – DESA, the Chairperson of the Permanent Forum on Indigenous Issues and others. 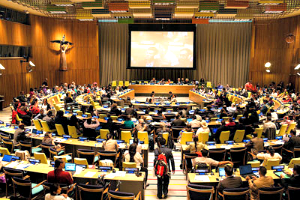 An interactive dialogue entitled “Indigenous Media, Empowering Indigenous Voices”, took place at the ECOSOC Chamber. Some short clips and videos were also screened during the commemoration.